Every now and then an invention completely redefines a genre. The iPhone. The microwave oven. Snuggies. The Kel-Tec KSG. While the 14+1 round shotgun doesn’t instantly render current home defense scatterguns obsolete—wait. There’s no getting around it. It does. 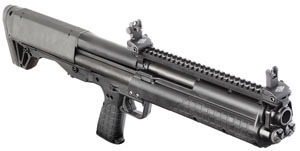 The KSG has at least three major advantages over any other home defense/tactical shotgun currently on sale to U.S. consumers. For one thing, the Kel-Tec KSG sends a message to all other home defense shotguns: get small or go home . . . Thanks to its bullpup design (the action sits behind the trigger group) the KSG is one seriously short shotgun. The Floridian firearm stretches a scant 26.1 inches from stem-to-stern. For comparison, The Remington 887 Nitro Mag Tactical is a 39″ gun. O.F. Mossberg’s shortest tactical scattergun is the 590 Special Purpose (fans of The Jerk need apply). That piece tapes-in at 38 and 3/8″. The least length-challenged Benelli SuperNova measures 45″ tip to tail.